The Frederick Douglass-Susan B. Anthony Memorial Bridge, originally uploaded by Scott Thomas Photography. The Frederick Douglass-Susan B. Anthony Memorial Bridge is a triple steel arch bridge over the Genesee River in Rochester, New York. This photo was taken during the blue hour from the Genesee Riverway which affords scenic views of the Rochester skyline. To get to this area, look for the Corn Hill Landing shopping and restaurant district. The Genesee Riverway is behind Corn Hill Landing. Oh, and if you like pizza, check out Tony D’s Coal-fired Oven Pizza restaurant. Fabulous! 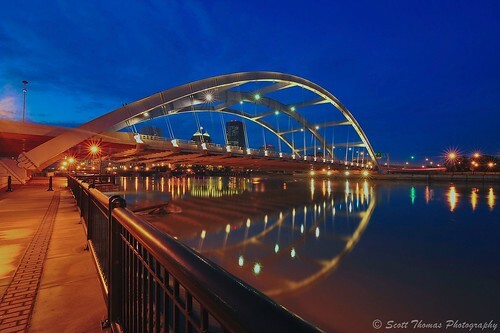 This entry was posted in Travel and tagged blue hour, bridge, buildings, corn hill landing, fence, frederick douglass-susan b. anthony, genesee river, lights, long exposure, memorial, new york, night, nikon D700, railing, reflection, riverwalk, rochester red wings, sidewalk, tokina 11-16mm, tony d's, tripod, water. Bookmark the permalink. Very nice, Scott! The warm orange tones complement the blue hour perfectly. Great composition and good use of leading lines. Thank you, Tracy. Working with a tripod pays dividends as it slows me down and I do “see” better that way. Need to do the same when I am not using one. I agree with Tracy, this is beautiful. Thanks, Michaela! I know it is hard to tell without a reference but the water is very high. Normally, there would have been lots of boats around but the canal had not opened yet to allow them access. Scott, that is one beautiful bridge, love the composition, colors and reflections. Like most normal looking things, once night falls with a little lighting added, the normal transforms into something beautiful. Wow. That is a beautiful shot. Interesting; I’ve never seen this bridge, and didn’t even know it existed. I love this shot! All the times you have been to Rochester and you have never seen this bridge? It’s right near the arena. You need to take a drive in the next time and thank you! This is gorgeous. Would you be willing to share settings? You have chosen a very good angle for this. Beautiful. What a great composition – I love the reflections from bridge and light.